The augmented reality wearable technology was used to assist with the complex medical procedure. 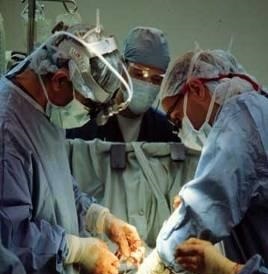 Despite the fact that Google Glass has been falling out of the spotlight over the last while, the device has managed to make headlines once again as cardiologists have now used the wearable technology to assist them in completing a surgical procedure to unblock the coronary artery of a 49 year old male patient. A custom app was created for the purposes of this procedure and the augmented reality headset displayed the 3D assistance. The Google Glass app was created to offer the surgeons a 3 reconstruction of the artery, which they could view through the headset throughout the length of the procedure. This made it possible for the physicians to more effectively guide a catheter to the area with the clog. Using a catheter was used to send a stent or balloon into a clogged area is a common method of treating a blocked coronary artery. It is a procedure that is called a catheter-based percutaneous coronary intervention (PCI). That said, there are risks involved with this type of surgery, as one of the most challenging components of the process is to image the artery. Google Glass made it easier for the doctors to use imaging and to view it in a way that could help to guide them. Computed tomography angiography (CTA) imaging techniques were used to view the patient’s specific blockage. The augmented reality headset then used the custom mobile app to display the patient’s own unique artery and blockage within the field of vision of the physician. This way, the doctor could visualize the patient’s own coronary vessel as the catheter was used for unblocking the area. In this specific surgery, there were two drug-eluting stents that were successfully implanted into the patient. Using this strategy with Google Glass, it means that the same CTA images become much more usable and practical for doctors while they conduct the procedure as they can view them at the same time that they are inserting the catheter in order to provide them with continual customized guidance.